Miniature tankard and cover of silver-gilt; embossed and chased; body of cylinder of rock crystal and octagon of rock crystal set into cover; openwork scroll border at top and bottom of body; band of embossed scrollwork on cover and round base; second band on foot has three frames with figures of Bacchus etc. ; knob of cover is group of lily-shaped flowers; plain handle with graduated pellets; thumb-piece set in openwork representing Susanna and the Elders; surmounted by crown. Origin: Uncertain; no silver punch-marks; previously described as 'South German (Munich? ), about 1580', but more probably substantially refashioned in London in 1896. Provenance: Stated in Read 1902 to have come “from the collection of Admiral Sir Robert Fitzroy, K.C.B. (1896)”, but there is no precise confirmation of the source to be found in the Christie's sale of the collection on 10 December 1896. As this kind of tankard would not normally be described as a 'Reliquary' - not even in a London auctioneers' catalogue of the 1890s - it raises the question whether the tankard could have reached Baron Ferdinand from the deceased Admiral's collection without actually passing through the saleroom in 1896, or whether it could indeed have been one of these “three cylindrical Reliquaries” (lot 139) which, after the sale, was altered to a purely secular - and more saleable - tankard form. The lot 139 was sold for £267. 15s. and was apparently purchased by a London dealer. It would have been a relatively simple matter to add a handle, hinge and cover, whilst retaining the original tubular rock-crystal with its high foot and its two openwork mounts (in the form of pierced strapwork) protecting the upper and lower rims. Indeed, the octagonal faceted crystal and the bunch of silver flowers may similarly have been part of the original reliquary, but then reset in the modern circular 'Renaissance' cover where they now seem strangely incongruous. Such a possible conversion in 1896 would satisfactorily explain the very pronounced differences that exist between the decoration on the foot and that on the cover. It would also account for the bad design of the join between the top of the handle and the mount around the upper rim of the rock-crystal. On the other hand, it would imply that the restorer produced the strange Susanna and the Elders thumbpiece, which is a most unexpected - and rather impractical - solution. Its apparently worn condition is in sharp contrast with the crisp detail of the adjacent surfaces of the cover, and may therefore be due to the poor casting or, indeed, to the condition of the original from which a mould was taken in order to produce this indistinct version. Today, it seems as curious a solution to have reached as the restorer's introduction of an enamelled silver disc towards the bottom of the rock-crystal tube. disfiguring solution, but at the bottom of the tube it is not readily seen and in 1896 would not necessarily have been identified by a potential purchaser as an integral part of the modern method of holding the object together. Indeed, it does so in such a rigid fashion that it would have successfully deterred the kind of dismantling process that has been carried out recently in laboratory conditions, and so it probably would have been able to preserve its secret. If, therefore, the object has been converted from a Renaissance religious reliquary, then the original parts may be of Spanish - rather than of South German - origin (for an example of similar mounts at either end of the rock-crystal tube see C. Oman, ‘The Golden Age of Hispanic Silver, 1400-1665; a catalogue of the collection in the Victoria and Albert Museum’, London, 1968, p. 40, no. 107, pl. 129, fig. 200). If, on the other hand, the object has not been converted from an older object, then it would present a series of baffling features that are not consistent with the known methods of most fakers of the second half of the nineteenth century. No faker starting de novo would create such an unnecessarily complicated construction with so many inconsistencies in the decorative aspects. Therefore, whilst the former published attribution remains wholly unconvincing in the light of this recent study, the confusing melange of 'good' and 'bad' parts on the object could, indeed, be the direct result of an inexpensive conversion in 1896 - or slightly earlier. 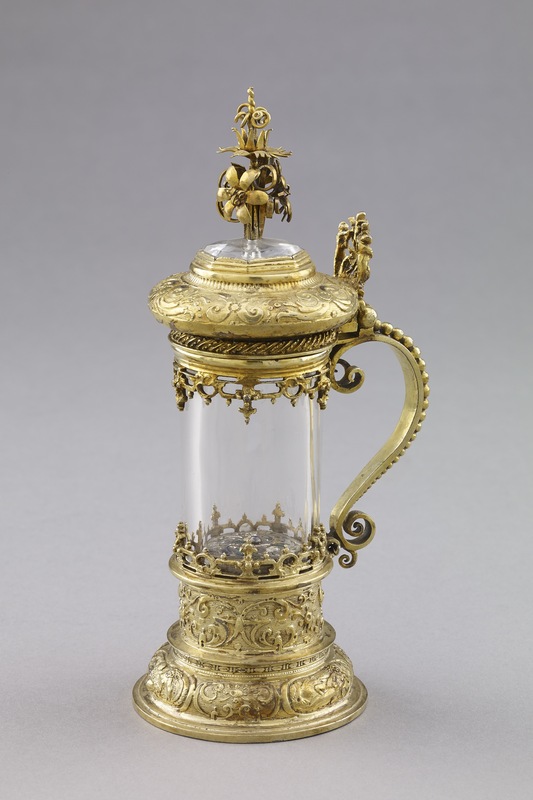 Unfortunately, it has to be pointed out - since it is not published elsewhere - that there was another spurious 'Renaissance' silver object in the Fitzroy Collection: the previous entry (lot 138) in Christie's sale of 10 December 1896 describes the famous Fröhlich standing-cup and cover, which is now in the Metropolitan Museum of Art, New York, and which, since 1982, has been officially recognised as a fake version of the historic Jacob Fröhlich cup belonging to the Worshipful Company of Broderers in the City of London (for a full discussion see Hugh Tait, ‘Catalogue of the Waddesdon Bequest in the British Museum: Vol. II. The Silver Plate’, London, 1988, p. 118, where it is argued that the New York pastiche was made in London soon after the 1862 Special Loan Exhibition at the South Kensington Museum). Therefore, if Admiral Sir Robert Fitzroy was purchasing for his collection expensive 'Renaissance' cups reputedly by makers like Jacob Fröhlich of Nuremberg, then it would seem equally possible that he might acquire another dubious pastiche. face decoration, especially in the broad band on the cover, that corresponds in many ways with the drum element and foot of the Waddesdon Bequest miniature tankard, nevertheless it is constructed in the normal sixteenth-century manner with three vertical strip-mounts encasing the rock-crystal cylinder and thereby securely linking the silver-gilt rim-mounts with the high foot. Indeed, the Emden tankard of 1596 - in its unaltered state - most effectively provides reliable criteria against which the London miniature version can be judged. Such a comparison leaves little doubt about the extensive nature of the modern alterations that have led to the creation of this highly unusual silver-mounted rock-crystal 'tankard'. Hugh Tait, 'Catalogue of the Waddesdon Bequest in the British Museum. II. The Curiosities', British Museum, London, 1991, no.45, figs. 377-382.